Richard Munzinger is a senior shareholder, having joined ScottHulse in 1966. He practices primarily in the areas of litigation and competition and antitrust. A member of the Texas Supreme Court Advisory Committee, Richard also serves on the Pattern Jury Charge Committee (Business, Commercial) and previously served on the Administration of Rules of Evidence Committee. Richard has lectured over many years for the State Bar of Texas on numerous litigation related subjects. He has also participated in continuing legal education activities sponsored by the Texas Association of Defense Counsel, the University of Texas Law School, the University of Houston Law School and the South Texas College of Law. He has taught in trial advocacy programs at the University of Texas, Harvard Law School, and the University of Michigan. Regarding professional recognition, Richard has the highest Martindale-Hubbell peer rating of AV Preeminent. An AV Preeminent peer rating reflects an attorney who has reached the heights of professional excellence. He or she has usually practiced law for many years, and is recognized for the highest levels of skill and integrity. 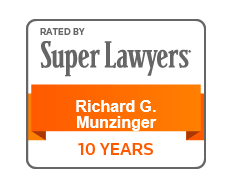 Additionally, Richard has consistently been recognized as one of the “Best Lawyers in America” and a Texas Super Lawyer for many years. He is a member of the El Paso Bar Association and the Texas Association of Defense Counsel. Richard was born and raised in El Paso, Texas, and earned both his B.A. and his LL.B. from the University of Texas. He is fluent in Spanish. City of El Paso v. Darbyshire Steel Co. et al., 575 F.2d 521 (5th Cir. 1978). Successful defense of price fixing allegations. Vandenburg v. Newsweek., 441 F.2d 378 and 507 F.2d 1024 (5th Cir. 1971). Successful defense of defamation claims. Seidenstein v. National Medical Enterprises., 769 F.2d 100 (5th Cir. 1985). Successful defense of group boycott and monopolization claims. State of Texas v. John Melvin Dorough. (Tex. App. -El Paso 1982). Court-appointed counsel for defendant in capital murder prosecution; avoided death penalty for accused. 2008, October 31. Finally, Some Direction on Defamation Jury Charge. Lecture presented at Page Keeton Civil Litigation Conference of the University of Texas Law in Austin, Texas.